In the first part of this paella post, we're gonna cover the story of paella and how I came about learning how to make one of my favorite dishes. In the second part I'll share with you how my paella turned out after I attempt to make paella on my own. 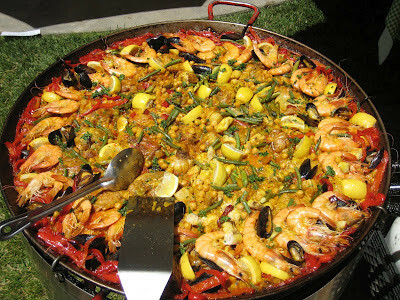 I will share with you the recipe used, steps involved, and tips to make a successful paella. Here's a little background on the national dish of Spain. 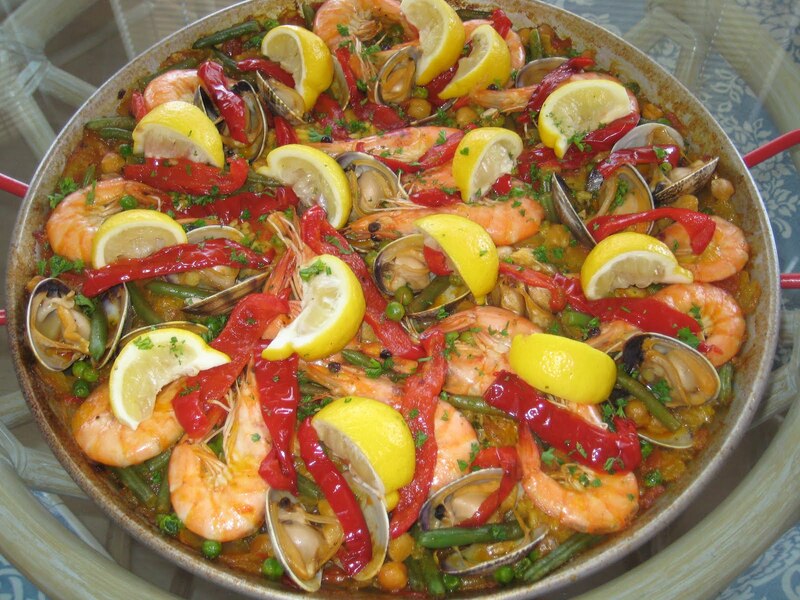 Paella is a rice dish known for its rustic nature yet complex flavor. 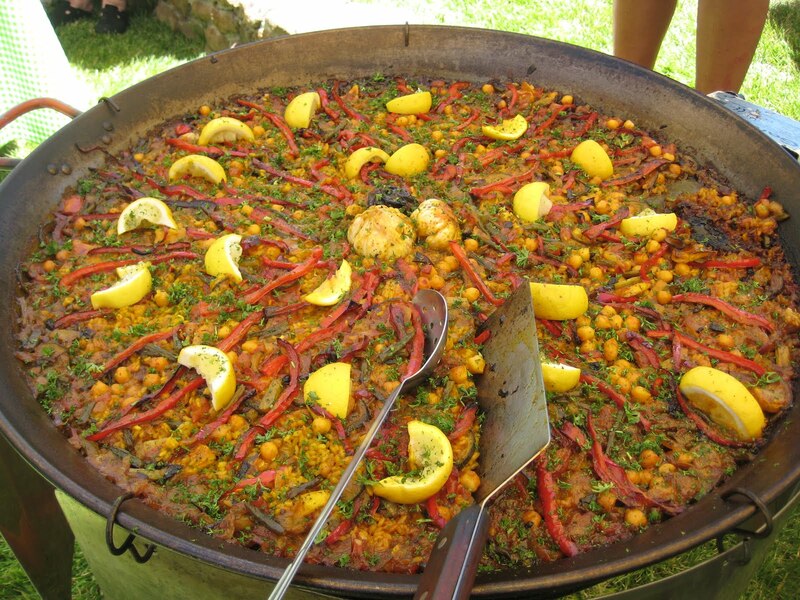 Paella originated as a Moroccan dish but evolved into the version we know it today in the Valencia region of Spain when field workers would take a break in the afternoon and cook rice over an open fire (often times over a grill - your standard Weber kettle charcoal grill would do just fine) with whatever ingredients they could find. Rabbit and snails were common ingredients, and it only became a seafood dish when the dish made its way to the coast of Spain where fresh seafood was abundant. You could find paella in other countries like Mexico and the Philippines as well, but when we think of paella, we mostly think of Spanish paella as opposed to Mexican paella and Filipino paella. I've even seen some paellas use squid ink making the paella black (paella negra). Paella in its simplest form always has rice, olive oil, and saffron. Saffron, one of the most expensive ingredients (per unit weight) in the world, is a spice that is harvested from the saffron crocus flower and which gives saffron its distinctive yellow color. Because paella is one of my favorite dishes, I sought a way to learn how to make a good paella. I first heard about Gerard Nebesky (chef and owner of Gerard's Paella) when he was challenged by Bobby Flay (a Food Network chef known for his Southwest cooking) in a paella throwdown (season 5, episode 4: watch the full episode above to see who prevails). FYI, one of the judges for this competition was none other than local B44 chef Daniel Oliveira who is also known for making a few paellas here and there. Gerard is known locally in Sonoma County (ie Healdsburg, Occidental, etc) which is just north of the San Francisco Bay Area for making very good paella with his gigantic paella pans at various festivals (Eat Real Festival in Oakland's Jack London Square, Maker Faire, Hardly Strictly Bluegrass, etc.) 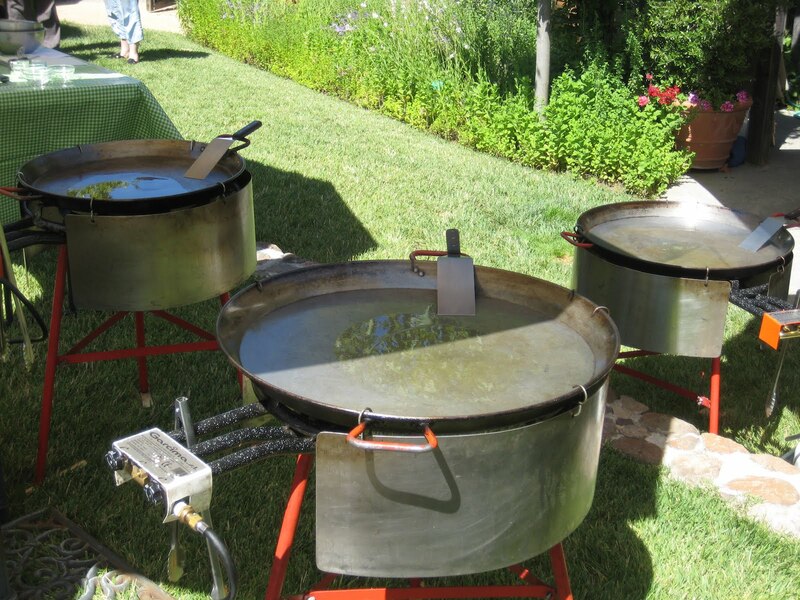 and other outdoor events - he even catered Teri Hatcher's 40th birthday party with savory paella for all her guests. I was lucky enough to take a class taught by Gerard himself. The class was held at a local winery in Healdsburg, CA. Gerard is probably one of the nicest people you'd ever meet. In addition to teaching us how to make paella (see the recipe), Gerard shared some of his experiences traveling and making paella in various parts of the world. 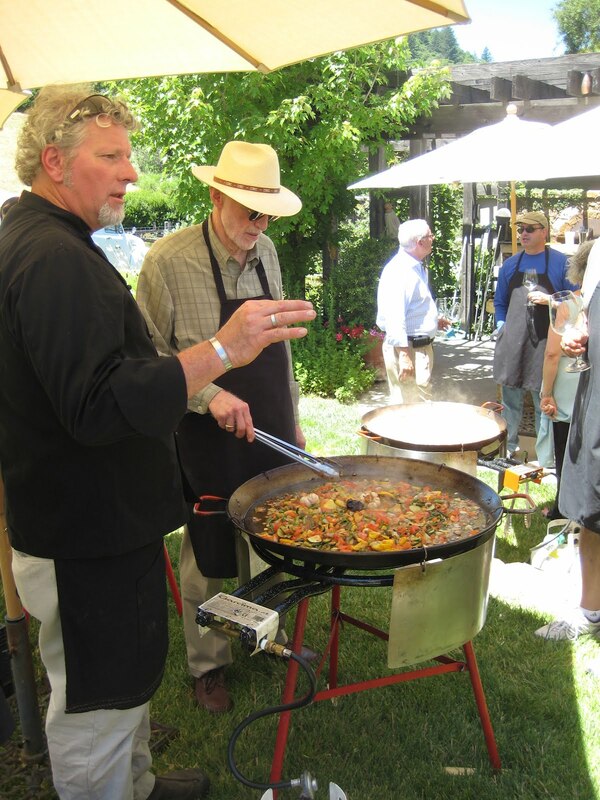 If you ever want to meet Gerard serving his delicious paella to the masses or you just want to drop by and say hello, you can find him at the Occidental farmer's market Friday afternoons in the summer. The best part of the paella is known as socarrat which is the slightly burnt, crispy part of the rice which forms the bottom layer (there's actually a paella restaurant in New York called Socarrat...be sure to pay a visit for lunch or dinner if you're in the Big Apple). Here are some photos taken in my paella class with Gerard Nebesky where we made 3 paellas: mixta (chicken and seafood), vegetarian, and chicken/chorizo. After learning how to make paella from Gerard Nebesky, I had to make a few paellas before I felt like I had it down. First, invest in a paella pan. It doesn't have to be expensive. A standard 15in paella pan (called a paellera) will only cost about $15-20. 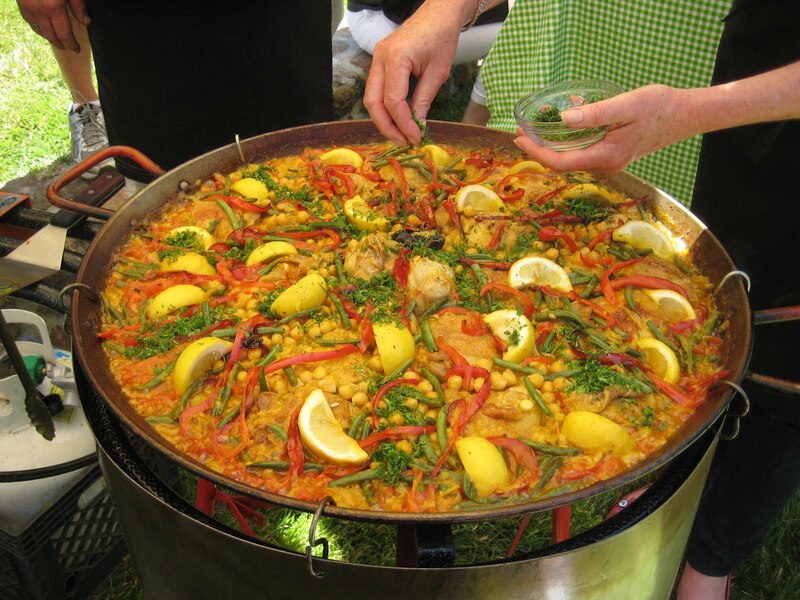 A paella pan will give you a large surface area with shallow depth to cook your paella on and remember to towel dry your pan after using and apply oil so it won't rust. Making a paella will take time (about 1-2 hrs). Every step in making paella just adds another layer of flavor, and time is the secret ingredient which will allow your flavors to come together at the end. Making a good paella definitely takes time. One thing I learned is to use a liberal amount of saffron. I know that saffron is one of the most expensive ingredients per once, but if you're going to be spending 1-2 hours making this dish, you might as well use a good amount of saffron to make a good paella. Don't believe in the notion that when using saffron, a little goes a long way. The paella we cooked in class was far better than the paellas I've had in 5-star restaurants (I've never been to Spain so I haven't had the paella there) even though these restaurants could charge up to $40 for a paella for 2 people. Often times when you go to a Spanish tapas restaurant (even a good one) and you order paella, the paella is color orange/red. This is due to the smoked paprika and the sofrito (tomatoes, onions, garlic reduced down). First and foremost, restaurants are in the business of making money, so using a good amount of saffron will cut into their profits. You want your paella more yellow in color, so spare no expense for your paella. Hopefully, you have a gas burning stove instead of electric stove because a gas burning stove would distribute the heat better. I had to straddle my paella pan over 2 burners and be constantly rotating the pan. You can cook your paella over a charcoal burning grill which would give it a nice smoky flavor. Gerard adds a whole head of garlic and only removes the paper skin. Once the paella is ready, you can easily remove the roasted garlic by squeezing it out of the paper wrapper and eat it with the rest of the paella. I must admit that the roasted garlic tastes really good. Even though it's hard to find, Gerard adds whole dried nora peppers. Obtaining the socarrat is difficult to do. When you add the rice, spread it evenly, and don't touch it once it's spread. This will help your paella get the ever important socarrat. As explained above, use a good amount of saffron. Clams take longer to open than mussels, so be sure to put the clams in first before the mussels. If you decide to add fish to your paella, Gerard recommends a light, white fish like grouper, snapper, cod, halibut, etc. Gerard likes to add garbanzo beans, and it's ok to use frozen peas and green beans. Do not remove the heads of the shrimp. The heads have a lot of flavor. The 15in paella pan that I use can feed 6 people if paella is the only thing being served. Gerard uses whole chicken thighs in his paella mixta (seafood and chicken) since his pans are huge. I use chicken drummettes and wings since thighs are too big for a 15in pan. Be sure to sear the chicken skin side down first to obtain a crisp and caramelized texture. 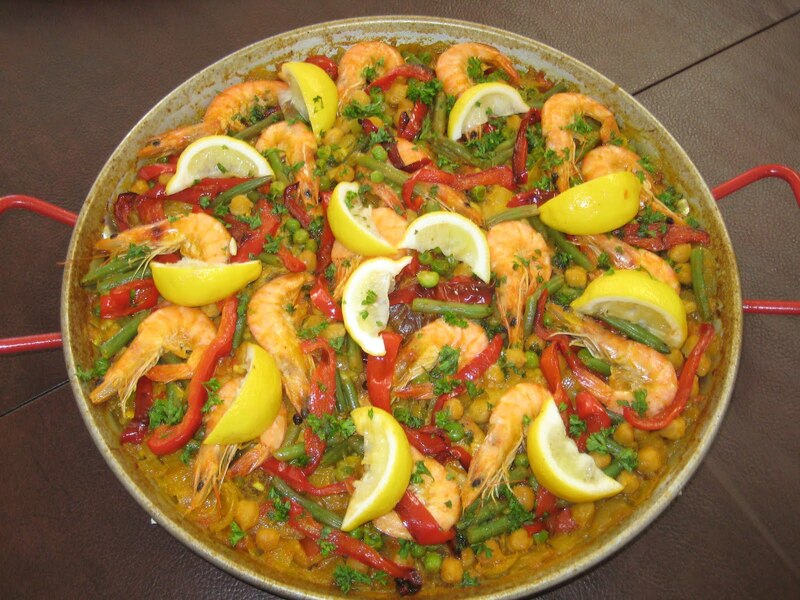 Serve your paella alongside tapas, various small dishes served as appetizers or snacks. Tapas can be anywhere from garlic shrimp (gambas) to empanadas. The rice normally used in paella in Spain are Calasparra (expensive), Valencian (expensive), or Bomba (very expensive) rice. You can get away with using any medium grain rice because it is comparable to the more expensive medium grain rices from Spain. Medium grain rice absorbs a lot more water compared to long grain rice. Please note to NOT use arborio rice which tends to be creamy and is perfect for risotto where you're supposed to be constantly stirring it while it cooks which is not what you're supposed to do when making paella. Heat the paella pan over medium-high heat, add olive oil and garlic and fry the peppers. 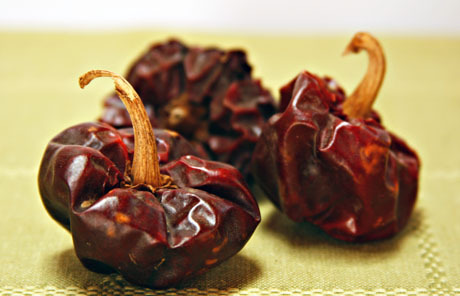 (Add more peppers if you want to serve some as an appetizer.) Remove peppers and set aside. Add chicken parts to the pan, turning to sear all sides. When chicken is golden, add the onions and saute until translucent. Add the tomatoes and the stock and reduce the sofrito base down for about a half hour. Meanwhile, crush the saffron with the smoked paprika in a mortar and pestle and add it to the stock. After a half hour, stir in the rice and let it simmer for about 20 minutes. Important: Do not stir or cover the rice. As the rice cooks, add the vegetables and the garbanzo beans. During the final 10 minutes, poke the shrimp and shellfish into the rice mixture so that they will cook. You will know the dish is done when you can smell the smoky odor of the rice caramelizing on the bottom of the pan, and all the liquid is absorbed by the rice. 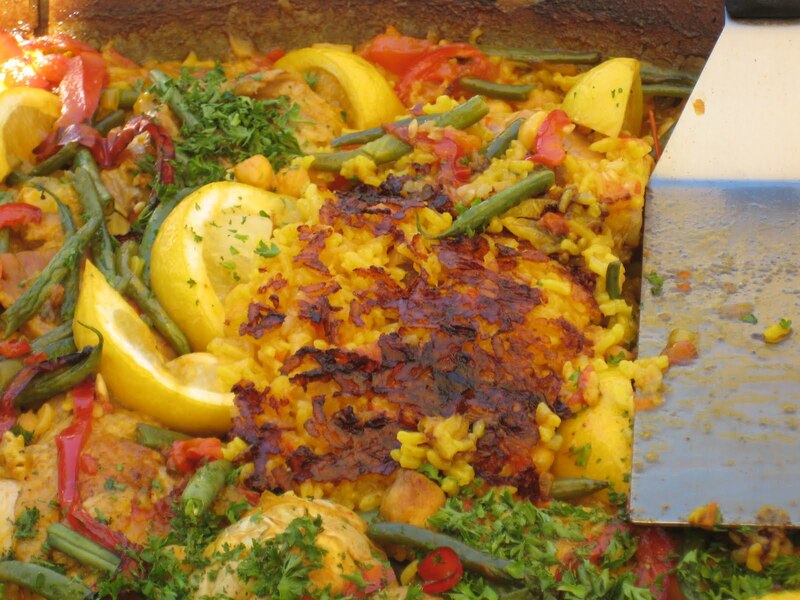 Finish with squirts of lemon and leave lemon wedges in the paella pan or perched along the rim. 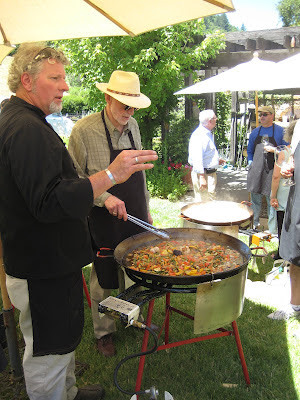 Part 2 of the video for Bobby Flay's paella throwdown against Gerard Nebesky is below. Part 2: does Bobby Flay beat Gerard Nebesky in a Paella Throwdown?